When you come to McCaw Hall for Amelia, you'll see displayed in the main lobby a flight jacket that belonged to Commander Albert Dodge McFall (1927-1966), my father, a 1950 graduate of the United States Naval Academy. The jacket is stitched with the patches of squadrons Cdr. McFall was attached to during his career. Cdr. McFall served one tour of duty in Vietnam in 1965, flying over 100 missions, for which he received air medals and two Distinguished Flying Crosses. At the time of his death, he was commanding officer of VA-76 ("the Spirits"), preparing for a second tour of duty in the Tonkin Gulf. He was lost after a catapult shot from the Bon Homme Richard in the Pacific Ocean. 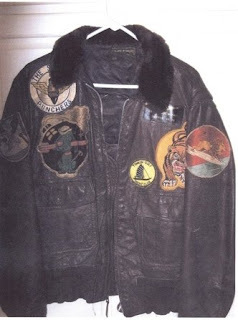 The flight jacket, along with the last letter sung in the second act (words culled from my father’s own letters), contribute to making Amelia a living memorial for a man who paid the ultimate sacrifice for his country and family. Cdr McFall lived in Seattle as a boy in 1939, when his father, Admiral A.C. McFall, was stationed at Sand Point. It is an honor to bring this jacket to Seattle for the world premiere of Amelia. That jacket is still looking great. It's a great contribution indeed for Amelia a living memorial. Currently what's the condition of this jacket, is it showing somewhere, I can go and watch.